Sterling Bachman, 11, subject and star of Sterlings Special Love Holds, joins his mother, Cindy Bachman, last week in the lobby of General Palmer Hotel. 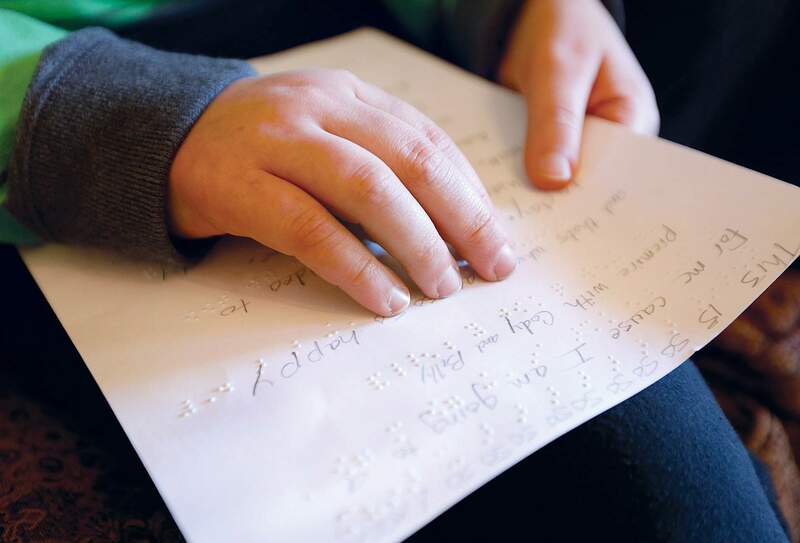 Sterling Bachman, 11, reads a letter printed in Braille in the lobby of General Palmer Hotel. Sterlings Special Love Holds, which was shown during Durango Film, chronicles his familys and his own efforts to rise above a genetic disorder that has robbed him of his sight. Maybe you saw the seven-minute film Sterlings Special Love Holds last week, and, maybe, if you werent paying close attention, you were perplexed. Who is this Sterling kid, you queried, and what makes him a star? This is a story about a lovable, strong-willed kid. Or maybe its about parents desperately battling his rare condition. Or its about films that celebrate a childs indomitable spirit. Take your pick  its all here. The 11-year-old with a slow-growing tumor in his skull is the leading man in a short film that was shown at Durango Film. The movie is called Sterlings Special Love Holds  perhaps because The Love Bug was already taken. Because I have lots of love in me, he answers, in a manner thats anything but boastful. On the morning after a long day of travel from their home in Connecticut, the Bachmans  Cindy (mom), Bob and Sterling  are sitting in the lobby of General Palmer Hotel for an interview. Theyre embarking not only on a weekend of movies and panel discussions involving the festival, but its their first real vacation together. Ever. The reason for that, and the reason that Sterling became a movie star, is not only empathy for his fellow man, but his physical condition. He has neurofibromatosis, a genetic disorder that causes tumors to grow in the nervous system. In his case, a tumor developed where the optic nerves cross. Doctors discovered the tumor after Sterling had his first seizure when he was 18 months old. 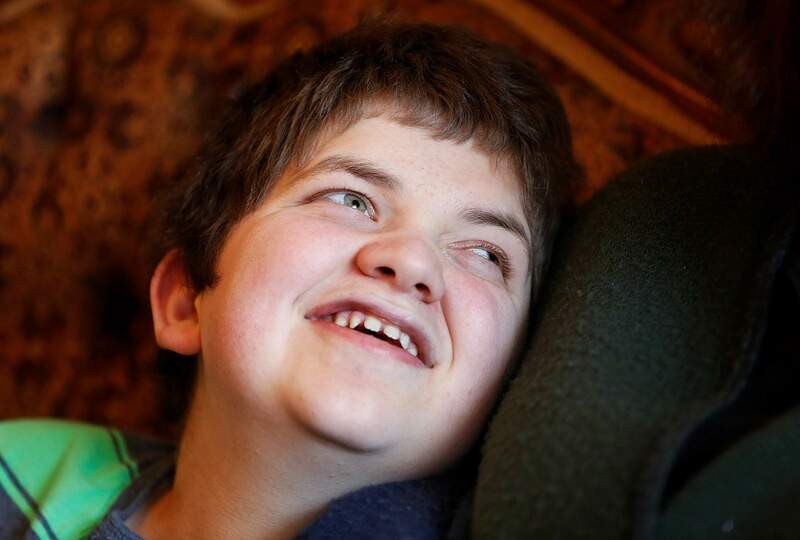 Dozens of seizures would follow  and trips to doctors and emergency rooms, and 53 MRIs. At 20 months, Sterling lost his vision, except for an ability to detect shadows. Off and on for the next nine years, he endured chemotherapy in a constant battle to keep the tumor from growing. About a year ago, the tumor eased up, and hes been off chemo since. Also, after a 40 percent boost in one medication, he hasnt had a seizure in four years. The Bachmans have been presented with many possible treatments, tried some, and had some actually work. Recently, they connected with Stephanie Angel, a New York-based filmmaker who, three years ago, created a unique niche with her Angelight Films. The 31-year-old collaborates with children who have brain and spinal-cord tumors. When Angel was 7, her 5-year-old sister died of a brain tumor. The films are a method of self-expression for the children, and a way of warding off the feeling of being a victim, Angel says in a phone interview from Connecticut, where, she says, shes freelancing for her day job. She makes the Angelight films when time and money allow. Three of the films screened at last years Durango festival. The kids have the ideas, and with her 10 years of experience, she makes them reality. Sterling, for example, came up with the films themes  music, eating pizza with friends, typing in Braille. Sterling gets to help toss dough at a local pizzeria, then pick toppings. When the pizza arrives, his friends are stunned to see there are marshmallows baked on. I didnt even try it, Sterling says with a laugh. In the final scene, Sterling and his music instructor, Billy Ayres, are singing about a train, and about toot, toot, which in this case refers to body-noise humor. They can barely finish the song theyre laughing so hard. Theres another purpose for the Angelight films, Cindy says. The easing of the seizures gave the Bachmans enough confidence to get on a plane with Sterling for the first time. They call it a series of amazing miracles that, with their now-middle-school-aged boy, they are attending a film festival in Durango. But youll remember him more as The Love Bug  for his ability to smile, and most of all, his empathy. The clerk at the hotel, the person walking past, the journalist pestering him with questions  he finds it important to reach everyone around him in a meaningful way.